Update : Today, 2019 – Punjabi University Result 2019. B.A, B.Com, B.Sc, B.Voc, B.Pharma, BCA, BBA, M.A, M.Sc, M.com, Mca, MBA Results for Patiala University available at punjabiuniversity.ac.in. Punjabi university patiala conducts various under graduate and post graduate exams every year. some candidates appear for semester based exams and other candidates appear in yearly or annual exams. Punjabi university Result for Bachelor of Arts (b.a), master of arts (m.a), bachelor of science Computer application, maths special exam (b.sc), master of science (m.sc), B.Voc semester 1st, 2nd, 3rd, 4th, 5th and 6th revised results. Bachelor of commerce (b.com), master of commerce (m.com), B.B.A, B.C.A, M.B.A, M.CA, B.A LLB, M.A LLB, LLB (Law) 3 year degree or 5 year integrated course. One year intensive diploma in french, Urdu, sanskrit, gurmukhi, Post Graduate Diploma in Folk Dances of Punjab, Punjabi Lok Sangeet & Sufi Sangeet, Counselling Psychology, Women & Child Development, Health Fitness Trainer, Child Care & Skill Development ,J.M.C. Post Graduate Diploma in Agricultural Marketing Management. Diploma in Gatka, Post Graduate Diploma in Yoga, Diploma in HIV/AIDS Counselling (Annual), Post Graduate Diploma Course in Translation Etc. Various courses results displayed below. Punjabi University Result of B.Voc Semester II Fashion Technology Exam Results 2018 (REVISED) 29 June 2018 Released. Punjabi Univ B.Voc Semester II Food Processing and Engineering Exam (REVISED) Results 2018 29 June 2018 Released. B.Voc Semester II Food Processing Exam (REVISED) Results 2018 29 June 2018 Released. Punjabi University Result B.Voc Semester II Software Development Exam (REVISED) Results 2018 29 June 2018 Released. B.Voc Semester II Retail Management & I.T. Exam (REVISED) Results 2018 29 June 2018 Released. B.Voc Semester II Fashion Technology Exam (REVISED) Results 2018 29 June 2018 Released. B.Voc Semester II Industrial Waste Treatment Exam (REVISED) Results 2018 29 June 2018 Released. B.A. Sem-IV & VI (RESCHEDULE of J.M.C. Paper) 29 June 2018 Released. B.A. Sem-IV Special Exam. 29 June 2018 Released. B.A. Part-III Special Exam. 29 June 2018 Released. B.Com. Professional Sem-VI Special Exam. (ON MEDICAL BASES) 29 June 2018 Released. M.B.A. Sem-II REGULAR & M.B.A. Five Year Course Sem-VIII,M.B.A. Sem-IV REGULAR & M.B.A. Five Year Course Sem-X (REAPPEAR) (REVISED) 29 June 2018 Released. M.B.A. Global Business Sem-II & IV (Reappear Candidates) (REVISED) 29 June 2018 Released. M.B.A. (Applied & Financial Management)(Five Year IC) Sem-II & IV REAPPEAR (REVISED) 29 June 2018 Released. B.C.A. Sem-II Special Chance (On Medical Basis) 27 June 2018 Released. B.A.Honors School Sem-V Political Science PREPONMENT EXAM. 27 June 2018 Released. B.A.Honors School Sem-IV History,POlitical Science,Punjabi, Dance & Gurmat Sangeet (REAPPEAR OLD SYLLABUS) 27 June 2018 Released. M.Ed. Part-II Distance Education Special Exam. (Medical Basis) 24 June 2018 Released. M.Ed. Sem-II Result 2018 24 June 2018 Released. M.A.Honors School in Economics (Five Year IC) Sem-II Result 2018. 24 June 2018 Released. Certificate Courses in Urdu,Persian,Arabic,French,German, & Diploma Course in French, Urdu & Advanced Diploma Course in French (REVISED). 24 June 2018 Released. Certificate Course in Spoken English (Distance Education)(Six Month Course) REVISED 23 June 2018 Released. Post Graduate Diploma in Forensic Science (Distance Education)(Annual) REVISED 23 June 2018 Released. Certificate Course (Sri Guru Granth Sahib Studies) (Six Month Course) REVISED 23 June 2018 Released. P.G.D.C.A. Sem-II REVISED 23 June 2018 Released. Certificate Course in Computer Applications (Six Month Course) REVISED 23 June 2018 Released. Post Graduate Diploma in Translation (Distance Education) (Annual) REVISED 23 June 2018 Released. Post Graduate Diploma in Journalism & Mass Communication (Annual) REVISED 23 June 2018 Released. Certificate Course in French & Urdu (Only for Distance Education Candidates) REVISED 23 June 2018 Released. Post Graduate Diploma in Computer Application (P.G.D.C.A.) (Annual System) REVISED 23 June 2018 Released. Important Information regarding Change in Time & Date of Diploma Examination (DISTANCE EDUCATION) 23 June 2018 Released. B.Sc. Biotechnology Sem-III SPECIAL EXAM REVISED 23 June 2018 Released. Certificate Courses in Urdu,Persian,Arabic,French,German, & Diploma Course in French, Urdu & Advanced Diploma Course in French 23 June 2018 Released. B.A. Sem-II REAPPEAR 23 June 2018 Released. B.Com. Professional Sem-III PREPONMENT EXAM 23 June 2018 Released Now. B.Tech. CE, ECE, ME, CIVIL ENGG (Semester-I,III,V & VII) PREPONMENT EXAM 23 June 2018 Released Now. B.A. Honors Gurmat Sangeet Sem-V PREPONMENT EXAM 23 June 2018 Released Now. B.C.A. Sem-II REAPPEAR 23 June 2018 Released Now. P.G.D.C.A. Sem-II Results 23 June 2018 Released Now. B.A. Honors Sem-IV Results 23 June 2018 Released Now. B.Sc. Honors School Course in Economics Sem-VI SPECIAL EXAM 23 June 2018 Released Now. B.Sc. Biotechnology Sem-V PREPONMENT 23 June 2018 Released Now. B.Sc. Biotechnology Sem-III SPECIAL EXAM 23 June 2018 Released Now. M.Phil. Sem-II Results 2018 23 June 2018 Released Now. M.B.A.Term-I & II (Reappear/Improvement/Special Chance) 22 June 2018 Released Now. M.B.A. Term-III Results 22 June 2018 Released Now. B.C.A. Sem-V PREPONMENT Results 22 June 2018 Released Now. Postponment of Paper of Post Graduate Diploma in Yoga Sem-II Results Released 22 June 2018 Released Now. Bachelor of Law (Five Year Course) Sem- III, V, IX 22 June 2018 Released Now. B.Voc. Retail Management & IT (Sem- IV) 22 June 2018 Released Now. Reschedule of Cancelled Paper of B.C.A. Sem-II 22 June 2018 Released Now. B.C.A. Sem-II Results 2018 22 June 2018 Released Now. B.Sc. (Mathematics,Computer Applications & Management) Sem-IV (Only for M. M. Modi College Patiala Students) 22 June 2018 Released Now. B.Pharmacy Sem-II,IV,VI & VIII (Reappear) 22 June 2018 Released Now. Post Graduate Diploma in Forensic Science (Distance Education)(Annual) 14 June 2018 Released Now. Post Graduate Diploma in Computer Application (P.G.D.C.A.) (Annual System) 14 June 2018 Released Now. Certificate Course in French & Urdu (Only for Distance Education Candidates) 14 June 2018 Released Now. Certificate Course in Spoken English (Distance Education)(Six Month Course) 14 June 2018 Released Now. Certificate Course in Computer Applications (Six Month Course) 14 June 2018 Released Now. Certificate Course (Sri Guru Granth Sahib Studies) (Six Month Course) 14 June 2018 Released Now. Post Graduate Diploma in Translation (Distance Education) (Annual) 14 June 2018 Released Now. Post Graduate Diploma in Journalism & Mass Communication (Annual) 14 June 2018 Released Now. L.L.B. Five Years Course Sem- II,IV & VI (Reappear) (REVISED) 13 June 2018 Released Now. Diploma in Computer Hardware & Networking (Sem-II) 13 June 2018 Released Now. Diploma in Divinity (Sri Guru Granth Sahib Studies) & Diploma in Gurmat Sangeet (Annual Examination) Revised 10 June 2018 Released Now. B.A. Honors School (Dance) Sem-II & IV (Special Exam) 10 June 2018 Released Now. B.Sc. (Mathematics,Computer Applications & Management) Sem-II (Special Exam) 10 June 2018 Released Now. Punjabi University Result Post Graduate Diploma in Hindi Journalism (Annual) 10 June 2018 Released Now. One Year Intensive Diploma in French (Annual) 10 June 2018 Released Now. Punjabi University Result Diploma in Sanskrit (Annual) 10 June 2018 Released Now. Diploma in Food Production Service & Diploma in Food & Beverage Service Sem-II 10 June 2018 Released Now. Post Graduate Diploma in (Folk Dances of Punjab,Punjabi Lok Sangeet & Sufi Sangeet,Counselling Psychology,Women & Child Development,Health Fitness Trainer,Child Care & Skill Development,J.M.C.) Sem-II 10 June 2018 Released Now. Post Graduate Diploma in Agricultural Marketing Management Sem-II 10 June 2018 Released Now. Diploma in Gatka Sem-II 10 June 2018 Released Now. Post Grduate Diploma in Dress Designing & Tailoring Sem-II 10 June 2018 Released Now. Org/Department Name: Punjabi University Patiala. Name Of the Examination: UG & PG Exams. Type of the Examination: University Exams through out affiliated colleges among Punjab. Duration of Exam: 3 hour paper. Classes Appeared in Examination: B.A, M.A, B.Sc, M.Sc, B.Com, M.Com, BBA, MBA, BCA, MCA, B.Voc Etc. Date of Result Announced: 29th June 2019 and Going. 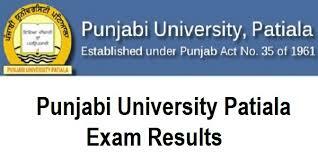 Punjabi university patiala M.A, M.Com, m.sc, m.b.a semester I, II, III & IV Results are now available to check at official web portal of punjab university punjabiuniversity.ac.in. other post graduate (p.g) courses conducted by Punjabi university annual results of April – May 2018 exams are also available on yearly basis such as Year 1st & 2nd. as we know there are only 4 sems or 2 years for any master degree through out our country. M.A (Master of Arts) Results 2018. 1st, 2nd, 3rd & 4th. Check Here. M.Sc (Master of science) Results 2018. 1st, 2nd, 3rd & 4th. Check Here. M.com (master of commerce) results 2018. 1st, 2nd, 3rd & 4th. Check Here. M.B.A (master of business administration) result 2018. 1st, 2nd, 3rd & 4th. Check Here. B.A, B.Com, B.Sc B.Ed, B.A LLB Punjabi University Result 2019 Declared on its website. well, everyone who is scrolling down internet and searching for their exam results. this is the place. as you all know university has started announcing results from the starting of June 2018. its 29th June and B.Voc results all sems released now. Uni. also released remaining Under graduate (u.g) results. therefore anyone who is looking for Punjabi university B.A B.Com B.Sc Results 2018 check below the table and download it now. B.A (Bachelor of arts) all parts. I, II, III, IV, V & VI. Available Now. B.Voc Results 2018 I, II, III, IV, V & VI. Available Now. B.com (bachelor of commerce). I, II, III, IV, V & VI. Available Now. b.sc (bachelor of science). I, II, III, IV, V & VI. Available Now. B.A LLB (Law). I, II, III, IV, V, VI, VII, VIII, IX & X. Available Now. Hv u any idea abt mba 3rd sem.result. I’m daily commenting but not get any reply.